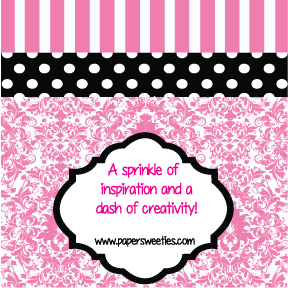 Welcome to the May Inspiration Challenge over at Paper Sweeties! I was so excited when I saw this one because it's full of my favorite colors which is what I drew my inspiration from .. as well as the pretty flowers on the cute little tea set. As I was flipping through my stamp sets ... thinking I'd probably use the coffee/tea set that have been been staring at me, I came across this lovely Showering You With Love stamp set and coordinating Sweet Cuts and I knew right away it's what I would use. Gardening is another one of my loves and although I don't see much rain where I live here in Arizona, when I lived back in Western New York this was my outfit for a good part of my growing season. Nothing like pulling on a pretty pair of mud boots (I added flower petals to some of my polka dots to change it up a bit on my boots here) and grabbing an umbrella to go out and pick weeds, or watch while the fish in the pond try to eat the "food" you're throwing them (but it's really just raindrops falling on the water), and if the rain stopped long enough, grabbing the camera and getting some beautiful pictures of the droplets on the flower petals. Love all the patterns on these stamps from the Showering You With Love set and that cute little sentiment. Of course I had to make more vellum flowers from last month's release Hello Spring. And hmmm... wonder where those cute little glittery hearts came from? This is what you call a sneak peek right here! OH.. and of COURSE I added some of the lovely Paper Sweeties flower shaped cup sequins in Marshmallow! Thanks for stopping and don't forget to check out all of the great creations my fellow Design Team members have concocted for you! And be sure to come back later this month for the May Release... you're gonna LOVE it! Welcome to this week's Atlantic Hearts Sketch Challenge! I'm also linking this one up to Aud Sentiments Anything Goes Challenge. 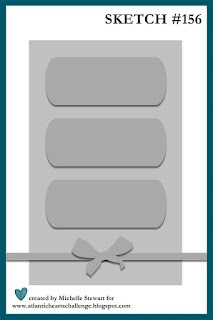 I had a few ideas for this week's sketch, but I needed to make a card for my 16 year old Nephew's birthday, and once again I have more ideas than time, so decided to go with it! Went to my local scrapbook store yesterday, Scraps of Love in Peoria AZ and one of my purchases was this very cool Carta Bella paper that had the treadmarks on it... since he loves to ride all kinds of things with wheels on them, I knew it would be perfect! I used the CDD Picture frame die and cut out the treadmark layer. Then I used my stitched circle dies from MFT to cut a circle out of the center and another one to cut the red circle out of the back of the treadmark paper. 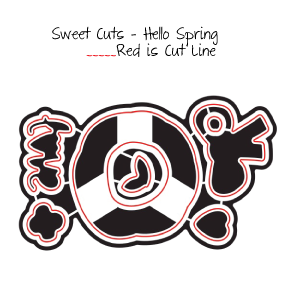 I consulted my bag of circles (whenever I cut circles on my cricut I cut a few in different sizes and keep a bag of extra ones and sometimes there is one in just the right size and color) for the black circle behind the red. Then I sliced my frame in half and cut a tiny bit off of the ends of each half to leave the space between the two pieces. I also used the CTMH Ink Blog set to add a little splat of platinum on the bottom left corner. I cut some gears from the CTMH Artiste cartridge in black cardstock and then sloppily added some versamark and Platinum embossing powder on them... I wanted to definitely make them imperfect and made the embossing uneven. Then I cut a couple fishtail banners out of black cardstock and some cool packaging I got with my latest electronics purchase and used an embossing folder with gears on it to emboss them. And loved the chance to use my CDD Wishful Thoughts Word Dies to cut the word "Big" out of the packaging again and the coordinating Wishful Thoughts stamp set to stamp in Versamark on a black strip and emboss in more platinum. LOVE these two sets together! Thanks for stopping and be sure to check out all of the great artwork over at Atlantic Hearts and play along! Also, there are some very cool creations over at Aud Sentiments and you should check it out! I used my awesome Waffle Flowers Doily Die... Just love the delicate lines of that one! I also used the My Favorite Things double stitched circle dies... great go to set when I need a quick circle...and stitches are yummy! Thank goodness for pre-made flowers, I cut the leaves and a flourish from the CTMH Artistry Cartridge... added some old school CTMH bling and done. Thanks for stopping by... sorry it's so short... or maybe you're relieved it's not my usual novel...lol! Come back Monday for the Atlantic Hearts Sketch Challenge! 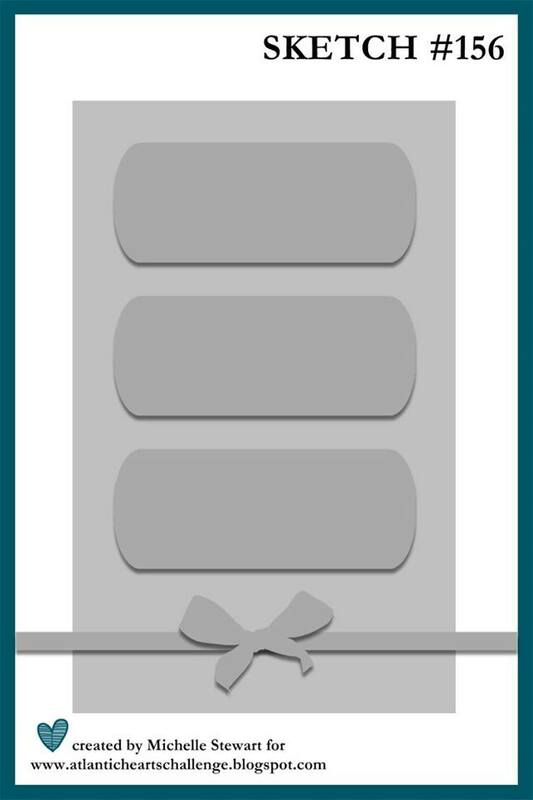 Georgie's colors are Juniper, Canary, and Whisper along with a few others.. but these are the focus of this card. The sentiment is from the current set, New Arrival and I love it. I used some awesome Paper Sweeties crinkly seam binding ribbon and some CTMH puffies and sequins along with a few Doubleclick Skittles. Another one of my recent faves is the stitched cloud dies from Craftin Desert Divas The Sky's The Limit die set...so sweet... especially cut out of glitter paper. Welcome to this week's Crafting Desert Divas Linky Party! 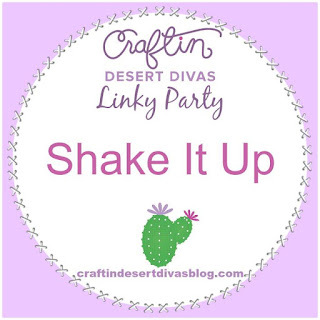 The theme for this Linky Party at Craftin Desert Divas is “Shake It Up”! 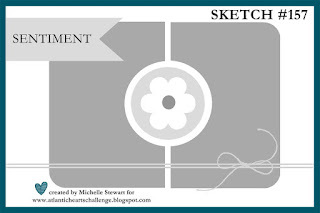 Please play along and create something that fits this week's theme and link up at the Craftin' Desert Diva’s Blog. 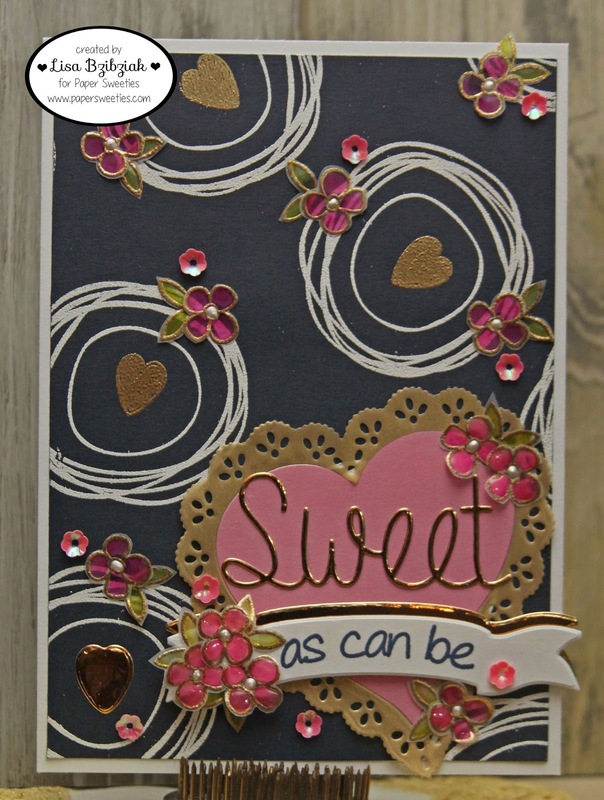 This week, I used a whole bunch of Craftin' Desert Divas products to create this three layer shaker card. I started with my new Picture Frame die which I LOVE. I actually used the biggest frame cut for the top layer and then made the center into another frame using the Fancy Frames die set and used it as my middle layer. The waves and sand were cut from some watercolored papers I'd made previously. I like making them in various colors to choose from because I have no patience for drying time...lol! Now, only the first bottom layer is an actual moving shaker. I intended for the second layer also to be shakable, however, I realized after I started that my design was not going to allow it so rather than start over... which I almost never do... I affixed the blue sequins in a random pattern to feel like they move. I used the Outdoor Landscape dies for the waves and sand. My base is cardstock sponged with oranges and yellows. I cut the sun using the Sky's The Limit die set and adhered it to the base, then two layers of waves. I added my Citrus Bliss sequins and then covered it with my smaller frame and clear cardstock. Then a layer of waves, and I adhered some Moonlit Kisses sequins and my second frame with clear cardstock. Then on top another layer of waves and then the sand and of course... some more sequins. I intended to use this little Coffee Cup Mouse during the Coffee Lover's Blog Hop, but I had more ideas than I had time... so here she is floating on over to see her friends... she brought the cup.. hopefully they've got a pot brewing! I drew on some lines to make a striped cup and I stamped and colored some flowers from the new Flowers in Bloom Clear Stamp Set and the little clam from Magical Wishes. Friends waiting patiently.... I used the adorable Chamelon mini stamp set (his face is matching the sunrise) and this awesome new Flamingo Digi Stamp (comes WITH the palm tree) available in the CDD shop! So please hop around to check out all of the Design Team's awesome projects and then join in on the party! Thanks for stopping and please do come again soon... I'll have the coffee brewing! 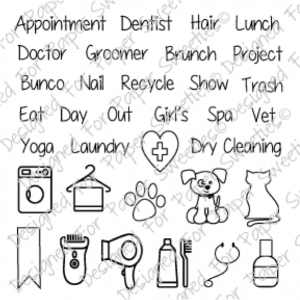 The Cutting Cafe Clear Cardstock-Um Yes Please! This Butterfly Treat Box is so cool! And you can cut it out of cardstock... or here, I used the clear cardstock as a base and then covered parts of it with various printed paper and cardstock. The paper is Graphic 45. And the For You Mom Overlay set comes with some really cute sentiments to print and use on your projects if you wish... I used one of them here.... again.. you!... focus. 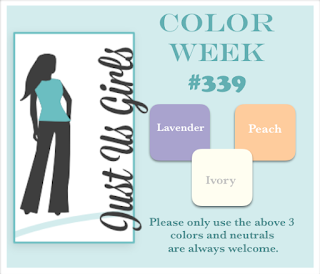 I'm also playing along with the Just Us Girls Color Challenge #339 using Lavender, Peach and Ivory... Sorbet is the closest color I had to a Peach so I went with it. Here's a view from the side so you can see how cute the clear cardstock base and handle are. I added some Shimmer Trim to the handle.. you know.. so you can find it... cause... it's Clear! And I used my Liquid Glass for adhesive because ... well... it's Clear! And here it is all shook up... I used a mix of some of my favorite sequins to get the right colors for the challenge. And please... if you think this is cool... please be sure and hop on over to my fellow Cutting Café teammate's blog and check out her piece of art with the clear cardstock... you really don't want to miss that... do yourself a favor and visit Mitra here! I added a few flowers that I colored with my Shin Hans, glittered with some Tim Holtz Distress Glitter and sprinkled a few more sequins and other doo-dads around. Be sure to check out the Just Us Girls Challenge blog and play along! Paper Sweeties April 2016 Release Rewind! Release Rewind Day is the day we like to mash up the Paper Sweeties.. old and new together! For today's project I used lots of old with lots of new. 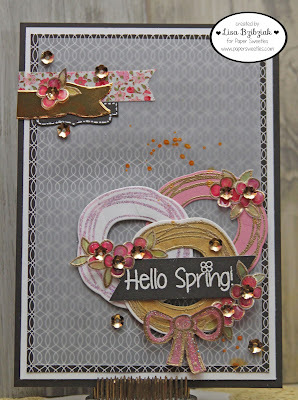 I love this wreath from the new Hello Spring Stamp Set as a background stamp. Instead of black, this time I used some navy blue cardstock and stamped and embossed the wreath in white in a random pattern. Then I used the heart from the Hello Spring set, stamped the outline in Versamark and then filled in the inside of the heart with my embossing marker and embossed it in gold. (Told you I made a lot of those little vellum flowers...) I'm playing along with the Aud Sentiments Anything Goes Challenge with this one too! Check it out and play along! LOVE the heart doily from the With Love Sweet Cuts (I love that this doily also cuts the center so you can keep it the same color or you can mix and match), the word "Sweet" from the Happy Sweet Cuts, the sentiment "as can be" from the Happy Stamp Set, and the banner from the Be Happy Sweet Cuts. Be sure to check out what all of my other cohorts have come up with you for today and then stop by the Paper Sweeties Shop and sit and wait for your Happy Mail to come! Be sure to check out all of the great new products in the Paper Sweeties Shop and don't forget to play along with the April Inspiration Challenge! Paper Sweeties April 2016 Release Party! The bow I embossed in gold also, but then I used my embossing pen to fill in the inside and used some pink glittery vintage powder to fill it in... and the other thing I've been loving is a white sentiment on black cardstock... 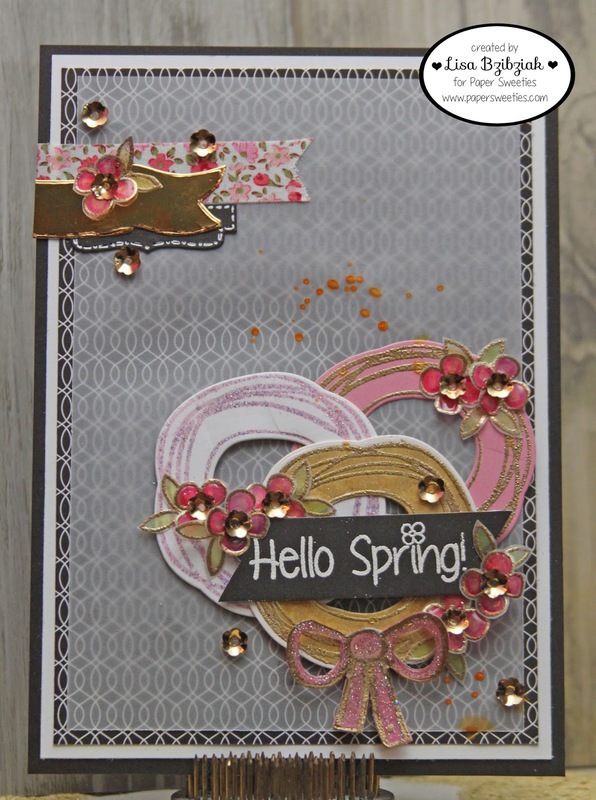 I used the cute Hello Spring sentiment from the new set also. I'm playing along with Aud Sentiments Anything Goes Challenge also! I felt like the upper left corner needed a little something so I filled it in with a few leftover items from previous projects, a banner cut from the Be Happy Sweet Cuts Set﻿ and of course, some Paper Sweeties Gold Sequins! 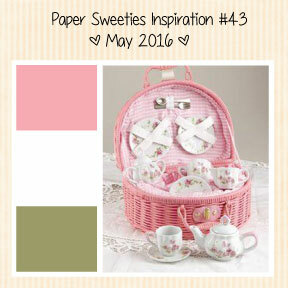 And there is still lots of time to play along with the Paper Sweeties April Inspiration Challenge! Thanks so much for stopping and don't forget to come back tomorrow for the Release Rewind! What Day Is It Anyway?!? So I know you know because I keep talking about it, but Tax Season. Ugh. 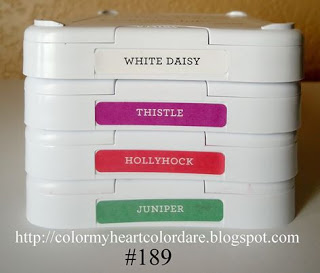 So yesterday morning I'm crafting away making something for the Color My Heart Color Dare Challenge featuring the CTMH Regatta papers colors and I wasn't quite finished when I had to get ready to go and I said... that's ok... I have until tomorrow... Thursday... um... would have been ok except it already was Thursday...lol! But luckily the Between The Folds challenge ALSO uses the colors of Regatta so although creating for the sake of creating is fun...it's even more fun when you participate in challenges... so I finished it up this morning and added some more things (since I was no longer strictly limited by the colors I changed it up a bit). I am LOVING my new CDD Picture Frame Die from the March release! Added a few silver sequins and used some of the cute Regatta Complements that come on Kraft paper. Love these sentiments from CTMH Pirate's Birthday and the ship below.. so cute! And a little Cashmere for the shell and a little gray for his belt. Don't you just love this little cutie from the Pirate's Birthday set from CTMH? 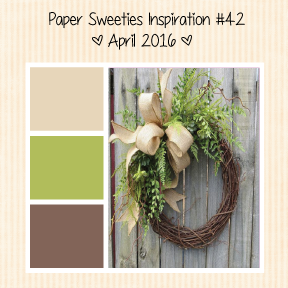 Welcome to Day 1 Sneak Peeks for the April 2016 Paper Sweeties Release! I've been loving the look of bold black and white prints along with bright florals so I thought this was the perfect opportunity to give it whirl! I used the wreath in the set as my flower base-stamped in Versamark on vellum and embossed in chunky gold. Then I colored the vellum with alcohol markers in bright colors. The brights along with the black and white and a touch of gold... LOVE it! I took some paper flowers, colored them with my Shin Han markers and added a little bit of gold embossing on the petals and placed them in the center of the flowers. Along with my Paper Sweeties Dies and Stamps... PERFECT! I added some leaves die cut with the Bee Happy Die Cuts from glitter paper and a cute gold on black sentiment from Hello Spring. 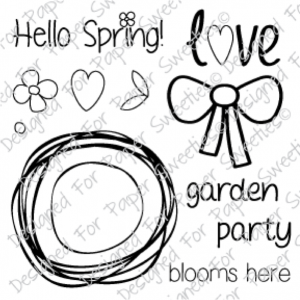 Here are links to all the awesome Paper Sweeties products I used including the new stamp and die sets, Hello Spring and Hello Spring Sweet Cuts (available tomorrow!) For the leaves I used the Bee Happy Sweet Cuts and of course I scattered around some of my favorite Paper Sweeties Gold Sequins! Be sure to come back tomorrow for the Release Party! And for today, check out what my fellow Design Team members have made for your viewing pleasure! Digital Stamps... Gotta Love The Versatility! A Color Dare and Less is More? Three Amigos Blog Hop April 2016!